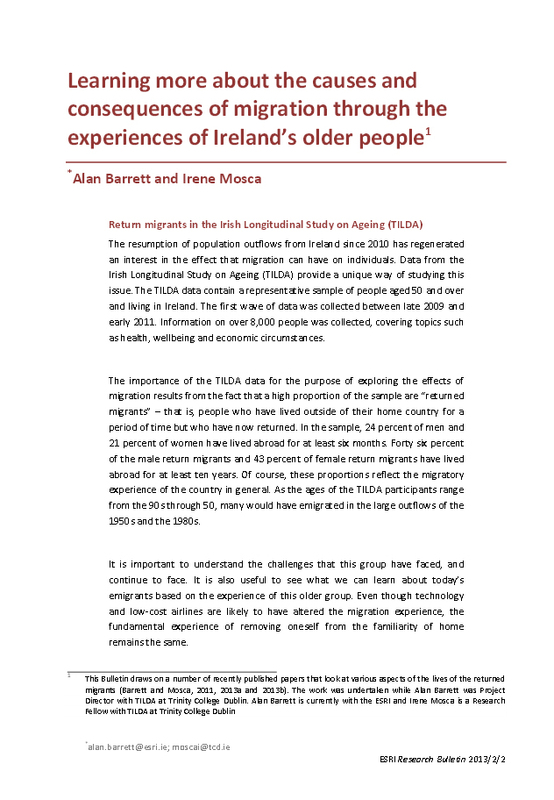 TILDA researchers Professor Alan Barrett and Dr. Irene Mosca authored a recently published ESRI research bulletin, drawing on TILDA data to examine the causes and consequences of migration in the Irish population aged 50 and over. A high proportion of TILDA respondents are return migrants, many of whom would have emigrated in the 1950s and 1980s, and the bulletin explores such questions as why people left, whether emigrants experienced higher levels of psychological stress over their lives and whether return migrants are now more socially isolated than those who never left Ireland. Professor Barrett has published an article summarising some of the findings in The Irish Independent (available here) and the bulletin has also been discussed in The Irish Times (article available here) and thejournal.ie (article available here).